Heading The bandage that stays on. Directions Clean affected area. Spray a small amount on the area 1-3 times daily. Let dry. A second coating may be applied for extra protection. To remove, apply more New-Skin and quickly wipe off. Fingernail polish remover may dissolve New-Skin. Store at room temperature away from heat. May temporarily sting upon application. Do not allow to come into contact with floors, countertops or other finished surfaces - will stain. 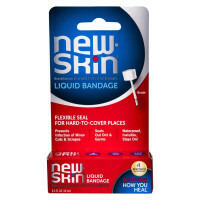 Uses First aid to help prevent bacterial contamination in minor cuts and scrapes. 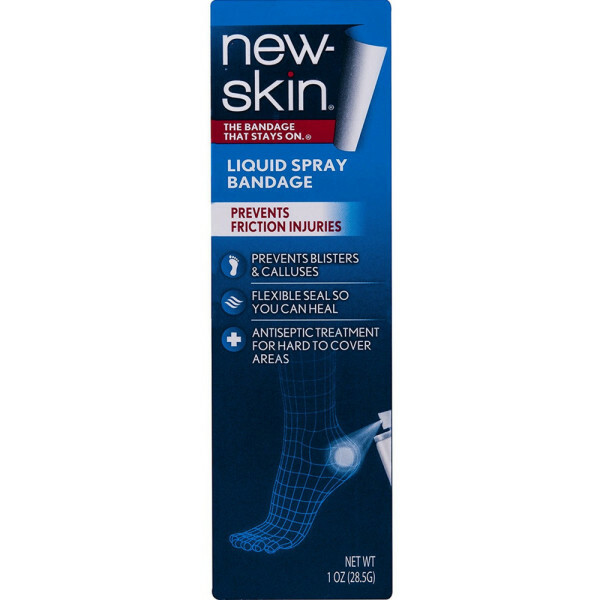 New-Skin Spray is for larger areas, such as legs and arms. 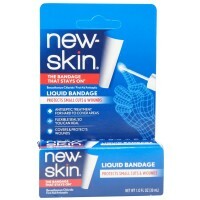 New-Skin dries rapidly to form a tough protective cover that is antiseptic, flexible, waterproof and lets skin breathe. Completely covers the entire wound to keep out dirt and germs. Try New-Skin Liquid for smaller areas. Protects cuts and scrapes. Prevents and protects blisters. Helps prevent the formation of calluses. Covers painful hangnails. Particularly useful for bowlers, golfers, tennis players, fishermen and musicians. Warnings For external use only. Flammable. Keep away from fire or flame. Do not use: in the eyes; longer than one week unless directed by a doctor; on infected areas or wounds that are draining; with other first aid products such as lotions or creams; over sutures; on mucous membranes. Ask a doctor before use if you have: deep puncture wounds, deep cuts, animal bites, serious bleeding, diabetes, poor circulation, serious burns. When using this product: do not puncture or incinerate-contents under pressure; intentional misuse by deliberately concentrating and inhaling the contents can be harmful or fatal. Stop use and ask a doctor if: condition persists or gets worse; infection occurs. Keep out of reach of children. If swallowed, get medical help or call a Poison Control Center right away.